The constellation Aquila. Roll mouse over to see labels. 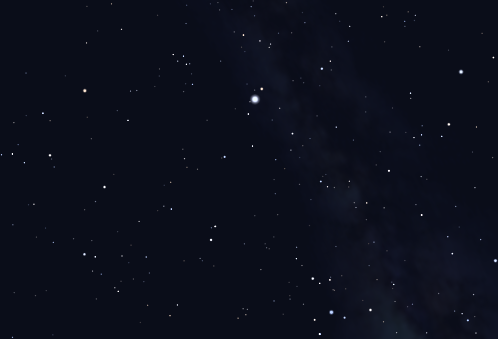 Aquila lies close to the celestial equator and is visible in the months around June. It is dominated by the bright star Altair, which forms one vertex of the Summer Triangle asterism and is the twelfth brightest star in the sky. The Milky Way passes through the constellation and so it contains numerous open clusters, though they are not as rich as the vast clouds of stars visible to its north in Cygnus. Aquila is depicted as an eagle, identified in Greek mythology as the eagle which carried and retrieved thunderbolts for Zeus. 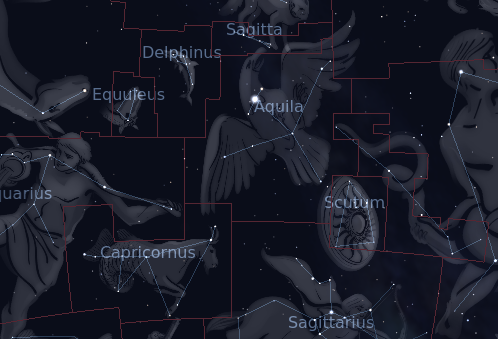 The following constellations neighbor Aquila: Aquarius, Capricornus, Delphinus, Hercules, Ophiuchus, Sagitta, Sagittarius, Scutum, Serpens Cauda.